Easy to use - no burnishing required. Maximum scuff resistance. Low maintenance requirement. •Dries to a wet look gloss. •Protects and prolongs the life of flooring materials. For all linoleum, P.V.C., rubber, sealed cork, sealed wood, terrazzo and thermoplastic floors. N.B. Not suitable for unsealed wood, unsealed cork or laminated flooring. 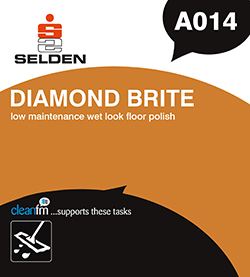 Diamond Brite must be applied to a clean dry floor. If required strip old polish with Selate or Selstrip. Apply a thin even film using a clean lint free mop or applicator. Apply a second coat when the first is dry (approximately 30 minutes). Additional coats enhance the finish. May be readily maintained with Selsheen or Fastlane. Coverage rate: 60 square metres per litre.